"Hotel restaurant", words that conjure visions of conveyor-belt toast and a queasy sense of underwhelm. If there's a type of eatery that is ripe for a makeover, it's this. 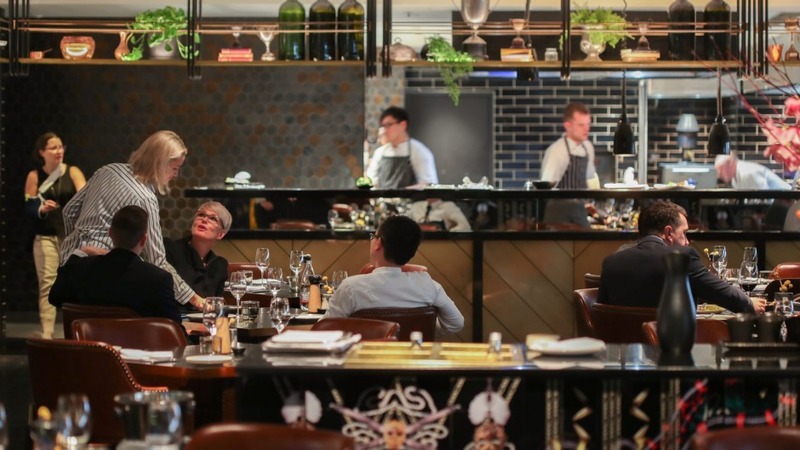 Andy Harmer, who started his career as a 16-year-old in a five-star hotel in England, has taken over the dining at QT Melbourne and given it a vigorous shake-up, aligning the food offering with the hotel's glitzy, polished brand. His first edict: "breakfast buffet begone", replaced by a proper Melbourne brunch, including smashed avocado with a 62-degree egg. Room service has become a drawcard, not a slacker's capitulation – could this be Australia's best club sandwich, on toasted ciabatta with barbecued chicken, iceberg with caper mayonnaise and crisp prosciutto? It's only for in-house guests so consider booking a city break. The bar menu – available downstairs or on the rooftop – lists snacks like chicken hotdog with truffle mustard. It's quality stuff. Pascale Bar & Grill, the flagship 80-seat restaurant, is on song too, good enough to keep overnighters from stepping out into the big, bad city and to attract locals wanting an apropos business lunch or glam night out. The dining room is all moody gleam; a meat display cabinet and open kitchen shine like beacons. The menu is enormously appealing, offering multiple ways to play within a classic brasserie structure of poised entrees, grand mains and proper desserts. Solo diners can easily lob for linguine, a luxurious twirl of house-made pasta with truffle and various textures of mushroom. A table of meat-lovers might craft their own beef showcase: the grass-fed Scotch fillet for me, the rich Wagyu rump cap for him. Date-nighters can swoon over a fine dining feast. Whatever the occasion, everyone gets food that looks lovely and tastes great, much of it cooked over wood, a smoking ceremony that banishes any lingering notions of sterile hotel dining. 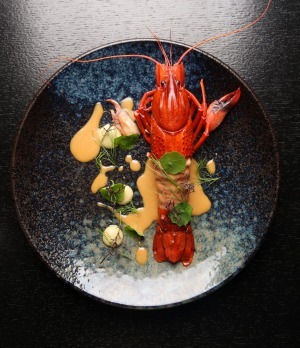 A marron dish signals the dining direction. The shellfish is briefly poached to ease it from the shell, then smoke-roasted over fragrant cherry wood to amplify the sweetness of the plump seafood. 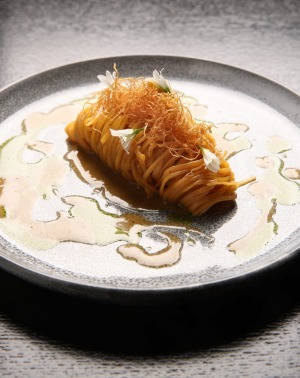 There's a chorizo sauce – a playful nod to surf-n-turf – and acid and freshness from desert lime puree and bronze fennel, grown in a rampant rooftop garden. The presentation is all drama – red shell, green herbs, blue plate – but the real impact comes from clean, balanced flavours that indicate a chef happy to let produce be the hero. Smoky heat isn't just lavished on meat – vegetable dishes are layered and satisfying. Beetroot is salt-baked, pickled, candied and generally loved up in a dish that also stars goat's curd, macadamia and a twirling rice cracker that adds crunch and wow factor. 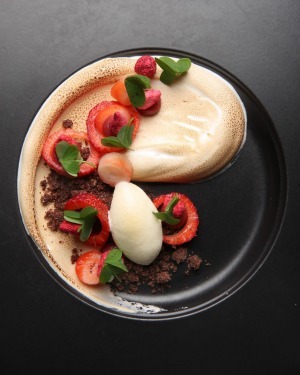 A kind of upscale pavlova underlines an indigenous ingredient thread that runs through the menu, as well as a flair for marrying unusual flavours. Some months ago, Harmer visited a eucalyptus farm, and happened to have a coffee in hand while smelling eucalyptus oils. The combination of eucalyptus and coffee stayed with him. He's added delicate Alpine strawberries and chocolate to create a contemporary pudding, underpinned by rock-solid technique. That interplay of the creative and the classic is key to this kitchen. After training up in that British hotel, Harmer gained experience in Michelin-starred high fliers before moving to Australia 12 years ago. He was executive chef at Vue de Monde, then spent four years at The Point. Circling back to hotels wasn't necessarily part of the plan but it's turned out to be a great move, for a chef in clover, and for Melbourne diners and visitors alike.